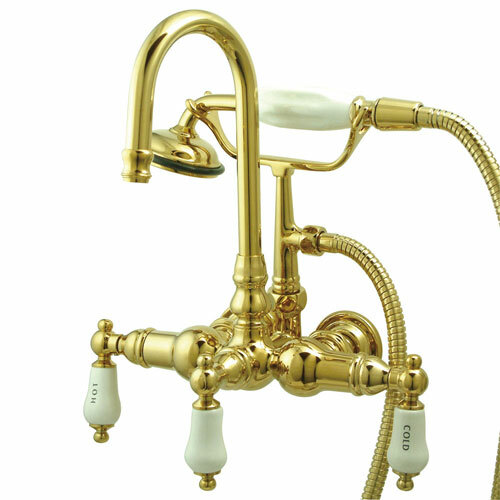 Kingston Brass Polished Brass Wall Mount Clawfoot Tub Faucet w Hand Shower CC9T2: This Wall Mount Clawfoot Tub Faucet with Hand Shower is built to last. The highest quality standards are used to precision manufacturer a top of the line product. Important features of this BRAND NEW Fixture: Complete Item! Everything necessary for installation is included. - White Porcelain Lever Handle - Matching Accessories Available - Easy to Install - Installation instructions included - Wall Mount Clawfoot Tub Filler Faucet with Hand Shower - Solid brass construction for durability and reliability, Premium color finish resists tarnishing and corrosion, 1/4 turn ceramic disk cartridge, Vacuum breaker for backflow prevention, 3 3/8-inch center-to-center spread, Vacuum Breaker in Handheld. 3/4-inch IPS Inlets, decorative hand shower included - 8-3/4-inch spout reach from wall - Tub wall mount or mount on freestanding supplies with 3-3/8-inch centers - 1/4-turn ceramic disk cartridge - Vacuum breaker backflow prevention - Standard US plumbing connections - Polished Brass premier finish designed to resist fading and tarnishing. This fixture is manufactured by Kingston Brass and is part of their Vintage collection.